Ever wanted to start up your own food truck with a group of friends.... in spaaaaaaaaaaaaaaaace? Well, then, good news everyone! 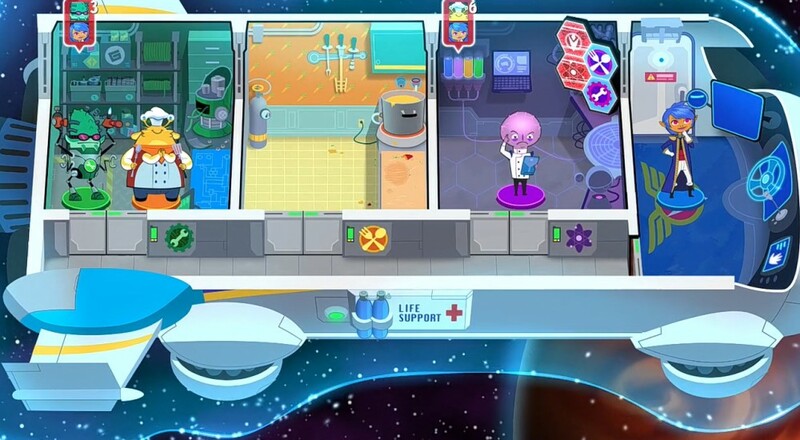 You can now live out your culinary dreams in Space Food Truck, a cooperative deck-building game that tasks you and your comrades with making the best dishes in the galaxy. The title arrived on Steam Early Access yesterday and I've had a chance to give it a little bit of a spin as any game that utilizes deck-building mechanics is a strong pull for me. Like many games of this ilk, each card has two values on it: a cost and a power. Power is used to avoid interstellar disasters (like the captain falling asleep at the wheel) as well as being used in conjunction with other cards to trigger an effect, such as making repairs to the ship. At the end of each player's turn, they may buy a card from the friendly "Zapmart" based on the total amount of cost on each of that player's cards either in play or in his/her hand. There's an interesting balance you need to strike with how much power/cost you have in your deck - the game actually include a stats meter for your deck to tell you your average - and how much you have to balance that among all the players. Check out this video from developer One Man Left Studios to get a better idea of how all of this works in action. Space Food Truck is on sale now for $16.19 and support four player local or four player online co-op. Page created in 0.6583 seconds.